Fun inflatables, high energy activities and exciting challenges all in Roberts Park! Based on the true story of the Beam family from Burleson, Texas. When 10 year-old Anna is diagnosed with an incurable digestive motility disorder that threatens her life, the entire family's faith is tested. Discouraged by naysayers, aka: "friends of Job," Mrs. Beam finds her own faith slipping away. Young Anna tries to stay strong, but even reaches the point of despair. And just when it seems that all hope is lost, the miraculous happens, restoring everyone's faith and bringing new faith to others. The Friends of Denso Marston Nature Reserve have a Dragonfly Workshop on Saturday 18th August. 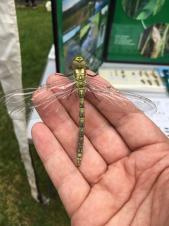 The event will start in the Reserve Education Centre, off Otley Road, Baildon, from 10 a.m. to 2 p.m., studying dragonflies from larvae to adults.To register and for more information please contact the Warden, Steve Warrillow, on 07919525913. HTML5 validated. WCAG compliant. Page generated in 0.1085 seconds.